Contact CHRM today for Oncology Medical Billing! Your days are long. From morning till past dusk, you are 100 percent patient-focused. From making your rounds with your patients at a nearby hospital or other healthcare offices to seeing patients and reviewing lab work and charts, you sometimes forget to eat. You don’t have time to deal with oncology medical billing. Period. Outsource oncology medical billing. Contact CHRM now! Oncologists are the unsung heroes of the healthcare industry since millions of people are diagnosed with cancer every year. Due to the nature of the disease, compassionate care is paramount to successful oncologists. Oncologists need to have a heart for patients and what they are going through when they are told they have cancer, as well as have the ability to detach from the heaviness of the struggle to beat cancer — and the unfortunate end of life when cancer wins. Every day in the life of an oncologist looks different. Typically, it begins early. If the oncologist has a family, it may involve getting the kids ready for school, helping with clothes, making lunches, and making breakfast before shuttling them off to begin their days. Usually, the oncologist starts his or her day in the office between 7 and 9 AM. After checking emails and phone messages, the oncologist usually has a staff meeting to review the day with his or her staff, regarding appointments, meetings, and other patient affairs. Then, the oncologist will typically visit their current patients either in the hospital or other healthcare facility. The rounds entails checking on patients’ vitals, checking on how they are doing, and answering questions from patients’ families. A quick bite to eat is grabbed usually sometime during this period. Then it’s time for office visits with other patients, which can involve ongoing treatments or new diagnoses. Often, lab work will be required and will have to be reviewed as well as other charts and tests the patient has undergone or will have to undergo. Callbacks to patients or other doctors take place next, which the office staff may perform as well. Throughout this time and in-between appointments, the oncologist’s time is filled with other tasks, such as signing forms, writing prescriptions, performing other paperwork, and communicating with staff on needs as they arrive. The end of the day arrives with possibly one more trip back to the hospital if the need arises. Then it’s family time, where the oncologist may pick up his or her kids or shuttle them off to sports, finishing the night with a good dinner and a book yields perfection. Comprehensive Healthcare Revenue Management (CHRM) specializes in oncology medical billing. We understand that time is of the essence, and when we examine your day, there is no time to worry about oncology billing. Let CHRM do the worrying. Contact us today! A big word that few know that it means. Some will recognize it as in the medical field. A few—namely linguists or entomologists—will recognize its Greek makeup and divine what it means. An oncologist is someone who is involved in the prevention, diagnosis, and treatment of cancer. This comes from the Greek word “onkos” meaning “tumor”, “volume”, or “mass” and the word “logos” meaning “study of.” Hence, the Greek tells us oncology is the study of tumors or masses. Oncologists are some of the most compassionate people in the medical field. They have to deliver devastating news, such as terminal cancer diagnosis, as well as good news, such as a patient has entered cancer remission. In all aspects, oncologists are dedicated to helping people overcome cancer. Comprehensive Healthcare Revenue Management (CHRM) is dedicated to helping oncologists do what they do best—take care of their patients— by providing the best revenue cycle management services specific to oncologists. We employ medical billing and medical coding specialists who have experience in the oncology field and understand the myriad of services oncologists offer in order to process claims correctly. Contact us today to learn more about our oncology billing services. Oncology is the umbrella for those involved in the diagnosis and treatment of cancer. Under oncology is different specialties, including surgical oncologists, radiation oncologists, pathologists, radiologists, and organ-specific oncologists. With such a complex, technical, and detailed array of services various oncologists offer, it can be hard on the billing department to code all the services correctly. Errors may be frequent, resulting in a delay in the revenue cycle and lost income for the oncology practice and denials may go up. In-house specialists. Comprehensive Healthcare Revenue Management hires medical coding and medical billing specialists who have vast knowledge and experience in oncology billing and/or experience in the oncology field. Our oncology billing experts specialize in the services oncologists provide and the particular codes correlating to these services. We keep up with the changes in coding for oncologists as well as changing technology in the field. We have a low turnover rate, which saves us money on employee training and recruitment, which are savings we can then pass on to our oncology customers. A breadth of knowledge. Here at Comprehensive Healthcare Revenue Management, we invest the time in training our employees in the latest changes in oncology billing, practice management, and concerns relating to your clinic and patients. We are available by phone during normal business hours Monday through Friday for both our customers and their patients to answer any questions they may have. We are happy to walk you through our revenue cycle processes and explain anything you don’t quite fully understand. We follow all applicable state laws and CHRM prides itself on being at the top of the game with changes in oncology practices and medical billing and coding. Flexible. CHRM will work with your current software or practices and help to make them more efficient. We will offer advice on medical billing practices and are available to consult on your medical billing needs. Our mission is to provide the best medical billing for our customers, and we can tailor our services to your individual practice’s needs. Accessibility. With Comprehensive Healthcare Revenue Management’s values of excellence, transparency, honesty, and integrity in all that we do, you always have access to your data whenever you like. We do monthly reports of your revenue billing cycle to ensure we are doing a good job as well as to give you the opportunity to review our processes and offer feedback on the job we’re doing as a company. We are always looking for ways to improve and client feedback is key to seeing things from an outside perspective. Denial claims management. With our dedicated staff who are assigned to your oncology account, we are proactive when it comes to denial claims management. Because our only job is maximizing your revenue cycle, we are able to handle denied claims efficiently and seamlessly. When we receive a denial, we investigate promptly to determine the reason. Once the reason has been determined, we fix the error and re-submit, usually with much better results. However, we don’t stop there; we learn from that mistake, so we don’t make it again. Odds are, a busy oncology practice dedicated to helping patients fight cancer, doesn’t have the time to follow up on every denial or error. We do. We are determined to help you get every penny you are owed, so you can pay your staff what they deserve for the lives that they save. Knowing the details to avoid the devil. 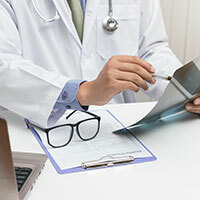 Knowing the reason behind medical denials (such as how Medicare requires a medical diagnosis of cancer before it will cover any chemotherapy services) allows Comprehensive Healthcare Revenue Management pivotal success in the revenue cycle collection process. Our medical billers understand the specifics and the differences regarding multiple chemotherapy administrations, chemotherapy infusions, injections, code bundling, and more. WHO CAN COMPREHENSIVE HEALTHCARE REVENUE MANAGEMENT HELP? Simply put, Comprehensive Revenue Management cares. We care about helping others, and we see our mission as helping oncology practitioners with their billing, so they can focus 100 percent of their attention on making their patients’ lives better. Let’s face it, medical billing and medical coding is challenging, especially on the collections side. CHRM empathizes with patients who are struggling to pay their bills, and we work with them on payment plans and all applicable insurances to help them pay their oncology bills. Oncologists have enough stress and worry with healing their patients; the last thing they need is to worry about how their patients pay their bills. CHRM takes this very sensitive piece off the table of oncologists, helping them to focus solely on the healing process. Comprehensive Healthcare Revenue Management is passionate about helping oncologists. We have a dedicated oncology account manager who oversees all of our oncology clients and works diligently to meet their unique needs. She works tirelessly to ensure the oncology medical billing staff is meeting our oncology clients’ needs. With ongoing training, up-to-take changes in coding, and ever-changing compliance rules, our oncology account manager ensures we’re the best oncology medical billing experts we can be. Comprehensive Healthcare Revenue Management strives to partner with our clients to accommodate all of their billing needs. We identify needs and individualize our services for each partner by assisting with billing, coding, documentation analysis, and education. We provide exemplary customer service and support for our group practices and individual physicians. Our Oncology department maintains certified coders and experts in medical and radiation Oncology to assist in this customized service. CHRM looks to partner with Oncology clients searching for a new approach to their revenue cycle management. Our staff includes experts in Oncology billing as well as professionals with clinical Oncology experience. This experience allows us to understand the environment that Oncology creates and what is needed to create and maintain success. At CHRM, we know that no two practices are the same. We provide a personal touch to our services giving our clients access to an experienced billing professional at all times. We emphasize continual education for our team. CHRM stays current on the latest reports and findings that are available for your field, including quarterly and yearly changes in medical and radiation Oncology. Our strong emphasis on data review and analysis allow us to identify trends in denials with claims and various other metrics. These tools allow us to maintain a level of transparency that many of our clients are not receiving with their previous medical billing company. Rest assured, CHRM is HIPAA compliant. We take seriously the privacy of our clients and all their patients and have very strict rules in place, so your information is not compromised. We are passionate about what we do. We fully understand the complexities of the oncology billing code system, and our staff is fully trained on all the clinical aspects of oncology, helping us to understand the services oncologists offer. CHRM lets integrity, honesty, excellence, and transparency be our guiding lights. Between continual education on all aspects and all specialties of oncology and our experience with recognizing common billing errors that lead to denied and mis-adjudicated claims, Comprehensive Healthcare Revenue Management believes we offer the best medical billing and coding services to maximize your revenue cycle management process. Contact us today for a free assessment of your company to see if CHRM can help you with your medical and billing needs!